The Violet Ottoman with Premier ComfortCore Cushion by La-Z-Boy at Conlin's Furniture in the Montana, North Dakota, South Dakota, Minnesota, and Wyoming area. Product availability may vary. Contact us for the most current availability on this product. Leg or Skirt Conical wood legs come standard. 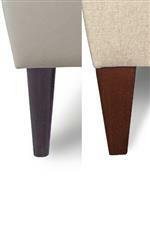 Tapered wood legs available for upcharge. Padding & Ergonomics ComfortCore? Cushions with zoned layers of support come standard on this model. Add cooling gel memory foam to your cushion by upgrading to ComfortCore? Gel. Small in size but big on style, Violet charms with her comfortable personality and graceful curves. Sofas and chairs from the Violet collection are designed for the modern, style-savvy space. And it's meant to be mixed and matched with on-trend accessories, so feel free to go wild. For a fierce look with fabulous comfort, we've decked out the seats with our Premier ComfortCore® Cushions. ComfortCore was specially designed with "zoned" areas of foam for softness and support where you need it most. The result is a gorgeous look you can enjoy for longer. The Violet collection is a great option if you are looking for furniture in the Montana, North Dakota, South Dakota, Minnesota, and Wyoming area. Browse other items in the Violet collection from Conlin's Furniture in the Montana, North Dakota, South Dakota, Minnesota, and Wyoming area.